A place for me to rapidly ramble about books, travel and life. The Missing Matisse is a memoir by Pierre Henri Matisse--a man who has definitely lived a life worth writing about. Pierre is the grandson of Henri Matisse, a world renown artist, though Pierre didn't know his family was famous for a long time. Growing up in Paris, France during World War II, Pierre aided his father in working with the French Underground. The war time meant one major life change after another for Pierre, his brother, and his parents. They moved often, and Pierre was frequently shuffled from one boarding school to another. With a reputation as a trouble maker, Pierre was considered a nuisance by many. When Pierre was twelve, his mother took him aside and explained to him that he must no longer go by "Pierre Matisse." Rather, he would take on the last name "Leroy." This confused Pierre immensely. He writes that he felt like his identity had been taken from him. This theme of his lost identity continues on throughout his life story. Throughout his life, Pierre follows in his famous grandfather's footsteps by pursuing art, which helps him face his identity crisis. After the war ends, Pierre continues to face hardships. He pens the stories of these hardships with beautiful honesty. 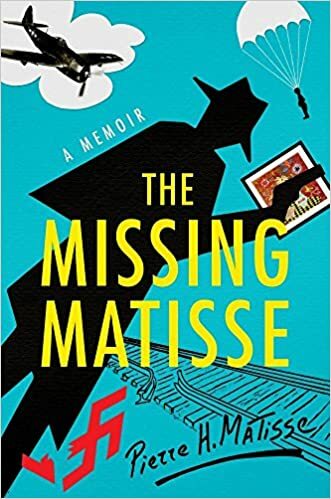 The Missing Matisse is a raw, honest portrayal of Pierre's life's failures and hardest moments, as well as his life's happiest times. Writing about his childhood, Pierre gives readers a glimpse of how World War II affected the French people. It is interesting to read about World War II from the perspective of a Frenchmen. By writing about his life after the war, Pierre enlightens readers about the realities of recovering from the war and the difficulties of immigrating to North America. Pierre Matisse has lived a fascinating life worth reading about. You can learn more about Pierre by checking out his Q&A with Tyndale Publishers. I also recommend that you visit the book's website and click on "tribute" to see some of Pierre's artwork. I received a copy of this book from Tyndale Publishers in exchange for an honest review. All opinions are my own. Dani Seilhamer. Awesome Inc. theme. Powered by Blogger.